In response to the growing demand for educational programs in veterinary medicine, VICSD is developing courses for veterinary technician training. Technicians successfully completing our educational programs will be awarded CE credit when applicable and certification by VICSD. VICSD certification gives technicians a competitive edge, providing employers and pet owners assurance that technicians have achieved a professional level of competence. We provide veterinarians with an efficient way to expand their imaging knowledge and expertise through innovative, rigorous, and focused continuing education programs. In keeping with our role as a leader in veterinary radiology practice and research nationwide, all VICSD-certified courses acknowledge that imaging education is a process that requires time, effort, and mentorship. This process begins with VICSD educational courses. VICSD works in conjunction with the American Association of Veterinary Radiologists (AAVR) to offer courses that help veterinarians and technicians improve their skills and provide the best diagnostic service possible to their patients. Veterinary MRI 101 with John Posh, R.T., (R) (MR) – An online 13-session course for veterinarians and veterinary technicians interested in learning proper techniques for obtaining quality MR images. 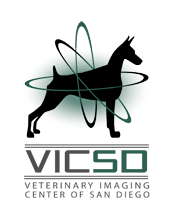 This is the nation’s first online CE veterinary MRI course! Ultrasound Training or Sabbatical – Highly personalized options for veterinarians and sonographers who have recently purchased or are considering purchasing an ultrasound machine. Whether it’s at our hospital or yours, let one of our expert radiologists teach you the techniques you’ll need to conduct a successful ultrasound study. Radiology Sabbatical – Spend one or two weeks at our hospital learning about the modalities you are most interested in. We will work with you to customize your time so that you get maximum results. AAVR Previous Online Radiology Rounds Subscription – Your subscription allows you access to videos of industry leaders discussing 12 cardiac cases with participating DVMs across the country. Online Radiation Safety Course with Candi Stafford, RVT (2 Units of CE Credit) – Course fulfills requirements for California radiation safety mandate that must be met by all veterinary professionals working with radiation equipment, and is taught by nationally recognized RVT, Candi Stafford. Be sure to sign up for the AAVR email list if you’re interested in future courses and events!